Not all innovative products revolve around incorporating technology into their usage, and not all products need a battery. Many products are simplistic in nature and use technology to focus on solving common problems that affect peoples around the globe. 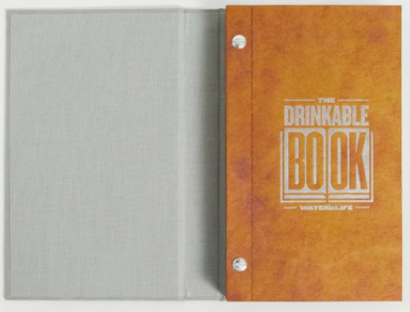 One such product is “The Drinkable Book” – a paper-based product (book) that addresses the need for safe water. The book is printed in non-toxic ink on paper that has been coated with silver particles which kill water-borne diseases such as typhoid, cholera, and E. coli. The Drinkable Book is 20 pages and each page/filter lasts roughly 30 days – thus giving the user a tool for clean water for the next year. The paper filters 99.99% of bacteria, making the filtered water comparable to tap water in the U.S. The paper, similar to a coffee filter, is easy and inexpensive to produce. The charitable organization which distributes the book is Water for Life, which sends the books with teams traveling to Africa, China, and India. Sometimes, it is the simple product that makes the biggest impact in lives. Have students review the Web site for Water is Life organization: http://www.waterislife.com/. In order to be successful, companies must be able to physically get a product into the hands of the customers. Discuss how a distribution channel works. For this product, what distribution channels are used now? How can the channel be expanded? What approach could be used? Divide students into teams. Have each team draw a flow chart for the distribution of the product.